Summer’s just begun, but before you know it, the holidays will be upon us once again. More Americans are beginning their holiday shopping earlier. Maybe it’s an effort to offset the expenses of buying so many holiday gifts in a small window of time, or maybe we’ve just become a bit more focused and organized, courtesy of recent difficulties in the economy. Regardless of the reasons, the holiday shopping is underway in many homes. Fortunately, finding the right gift doesn’t require you even leave your home. Gift cards are the ideal alternative, for many reasons. Finding the right gift can be a bit of a challenge, too. That’s one reason gift cards have become enormously popular in recent years. Here, we’re put together some of the most convenient and easy to access gift cards available on the market. You can even purchase them online with your credit card, for even more convenience, and have them mailed to the recipient at a time you select. What could be better? Always the perfect gift, no matter the occasion. Visa is one of the most well known names in the credit card industry. The Visa gift cards allow recipients to use the card wherever they choose, whether it’s online or at a traditional brick and mortar location. Users can even pay bills with their Visa gift card. Anywhere Visa is accepted, the gift cards are as well. You can easily personalize and design your own gift cards, too. 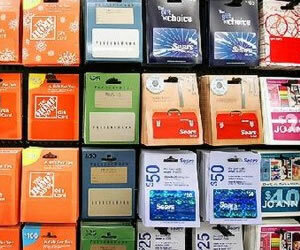 Birthdays, Christmas and graduations are popular occasions where the Visa gift cards make their appearance. You can also write your own message and load the cards from $20 all the way to $500 if you choose. The best part is there are no monthly or annual fees, nor are there any maintenance fees associated with the card. Your designated gift amount is what the receiver spends with no pesky stipulations. Visa will even deliver it free of charge when you select the United States Postal Service as the delivery method. You can also pay an additional fee for faster FedEx shipping. Of course, MasterCard has its own network of MasterCard gift cards. They too are easily personalized, customized and even predesigned for those so inclined. Add your custom message and you can easily upload a photo to serve as a reminder of the occasion. No maintenance fees to worry about and like the Visa Gift Cards, you can load the MasterCard with sums between $20 and $500, in any increments you choose. It is also shipped free via USPS with an optional FedEx delivery for an additional fee. American Express has two prepaid gift card options: those for businesses and of course, those for individuals. The AMEX Gift Card for businesses is designed for those who travel a lot on business. Users can incorporate their AMEX Membership Rewards along with a “bundle” of exclusive savings. You can load these cards with as little as $25 up to $3000. No maintenance fees, monthly fees or annual fees to worry about either. The American Express logo ensures the recipient is treated like royalty. Finally, we take a look at the American Express Consumer Gift Cards. It arrives with beautiful gold tones, the classic AMEX logo and can be used anywhere American Express is accepted. Free standard shipping is offered, which saves up to $5.95 for the sender, and there are many prepaid amounts between $25 and $500. It makes a great choice for college students, too. Parents can load the cards so that their college and high school students always have access to money for gas, books or even pizza. The best part, though, is if the card is lost or stolen, your balance is safe and can be refunded or replaced on a new American Express card. No additional fees of any kind round out this offer. You might think the holidays are still months away and that there’s plenty of time, but one thought of past holidays and the rush-rush atmosphere is often all it takes to inspire us to get a head start so that we can slow down and enjoy what the holidays are really about: friends and family.